This PDF 1.3 document has been generated by Vorschau / Mac OS X 10.11.6 Quartz PDFContext, and has been sent on pdf-archive.com on 09/09/2016 at 11:42, from IP address 80.187.x.x. The current document download page has been viewed 3834 times. File size: 712 KB (12 pages). 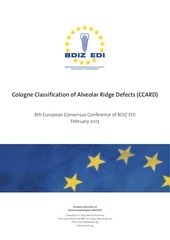 Why Cologne Classification of Alveolar Ridge Defect (CCARD)? processes are influenced in what manner, and what is the implication of the various treatment approaches for long-term implantological success? Ridge Defect (CCARD) was born. of the code (i/e) is not needed for the description of sinus defects. conditions. They can be departed from in exceptional cases (e.g. factors need further regulatory clearance in the European Union. outside the ridge contour) and makes recommendations on possible treatment approaches based on the current literature. Daniel Rothamel, PD Dr H.J. Nickenig, Dr Arndt Happe and Professor Dr Dr Joachim E.
of recommendation, discussing non-consensual issues, final voting. (type B) and combined (type C) defects (Allen, Gainza et al. 1985). preservation of the hard tissue in the extraction area will be missing. but also by bone resorption on the basal aspect of the maxillary sinus. Davarpanah et al. be assigned to Seibert classes I or II, respectively. smaller volume and lower soft-tissue pressure. bone may be required to achieve a comparable result that is stable in the long term. e.g. a vestibuloplasty or soft tissue graft will regularly be required. Conference should be considered (BDIZ EDI 2012). standard for any type of defect reconstruction (Schliephake, Neukam et al. 1997). autologous bone is introduced. Moreover, block grafts require an explicit fixation. outcome (Cricchio and Lundgren 2003, Silva, Cortez et al. 2006). area, where osteotome technique is limited to smaller augmentation needs (S.1). (H2x, H3x) and for augmentation outside the envelope (Hxe) (Canullo, Trisi et al. 2006). should maintain longer absorption time in the case of larger augmentation volumes. screws for “tent-pole technique”, membrane pins) may be considered. conditions and long-term results as the pre-existing bone (Chiapasco, Zaniboni et al. situations with minor vertical augmentation requirements (V.1.x) (Canullo, Trisi et al. matrix after horizontal split osteotomy (Smiler 2000, Jensen 2006). both with autologous bone and with bone substitute (Hallman, Sennerby et al. 2002). Kasabah, Simunek et al. 2002, Schlegel, Fichtner et al. 2003, Zijderveld, Zerbo et al. procedure, but occasionally also a one-stage procedure. need further regulatory clearance in the European Union. treatment is performed by designated specialists. combined defects (H, V, C), possibly in conjunction with a sinus area defect (+S). treatment approaches based on the current literature. This file has been shared by a user of PDF Archive. Document ID: 00481789.